Flat feet are extremely common, and are found all across the world. Flat feet are simply feet that have over-rotated (pronated) towards the inner side of the foot (the side facing the other foot). Flat feet are usually the result of one's own genetics inherited from their family. Many families pass along flat feet to their children. To be clear, flattening of the foot is a normal part of the walking cycle, where the foot goes through stages of rotating inward and outward. However, in some individuals, the foot flattens outward too much. This not only strains the tissue of the inner side and bottom of the foot, it also changes the way certain muscles in the foot and leg function in order to keep the foot from over-collapsing and hampering the ability to walk. This functional change causes numerous adaptations in the structure of the feet over time. Some of these adaptations can cause pain. Some people with flat feet may live their entire lives without having any problems, while some people may have pain starting in childhood. Because of the extra demand on foot and leg muscles, people with flat feet become fatigued easier, with leg pain or cramping after activity. This cramping is often in the muscles on the front of the leg (the shin), but it can also affect muscles along the side or calf as well. 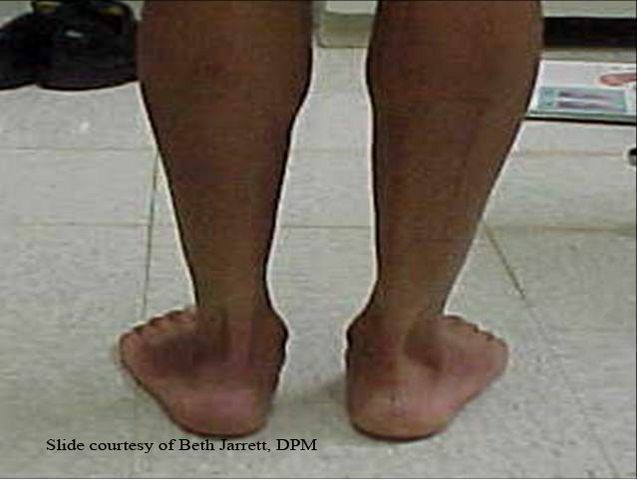 Severely flattened feet may cause hip, knee, or back pain, due to the over-collapse of the foot and the straining of the leg ligaments as a result. Some of the above-mentioned adaptations can include changes to the foot shape itself, with foot deformity the result. These deformities include bunions and hammertoes, the result of very complex changes in the balance of muscles that stabilize the toes. People with flat feet are also more susceptible to injuring their heel by straining a ligament called the plantar fascia found in the heel and arch, and can also be susceptible to strains and tears in a tendon on the inner side of the foot that can actually lead to more flattening of the foot. In the most severe cases, early arthritis may develop in a number of joints in the feet as a result of many years of collapse and wear. Several basic treatment options are available to control flat feet and help prevent further strain and deformity. Treatment with prescription shoe inserts (orthotics) is generally successful in treating many of those with this condition, as long as the foot is still flexible. Orthotics realign the foot to allow it to function properly, and are made by taking a mold of the foot when it is being held into a proper position (as opposed to a mold taken of the foot when one is already standing and already collapsed- which will lead to a poorly supportive insert). The orthotic is then fabricated from this mold by a precision laboratory using a podiatric physician's prescription to guide the process and further customize the fit. The orthotic helps to reduce much of the pain and fatigue associated with flat feet, and will help prevent further progression of associated deformities like bunions and hammertoes. Over-the-counter arch supports provide basic help, but cannot alter the foot structure as specifically as a prescription device can. Properly supportive shoes are also a necessity. Motion control or stiff-soled shoes are preferred for those with flat feet. Unfortunately, severe cases of flat feet require surgery to reform the foot into a more functional shape. This is especially true if the feet are rigidly stuck in the flat position without much flexibility. There are a multitude of different types of procedures to correct a flat foot, each addressing a specific component of flat feet in order to provide the most effective relief.